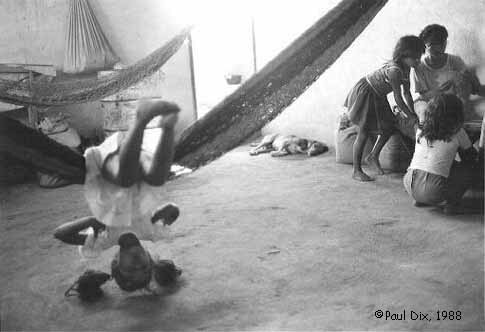 This page offers a sampling of photographs and stories of Nicaraguans collected by Paul Dix and Pam Fitzpatrick between 1984 and 2004. Paul and Pam's goal was to document and share with the people of the U.S.—through photographs and testimonies in Nicaraguans' own voices—the horrific long-term effects of the U.S.-sponsored Contra War (and ongoing U.S. policy) on the lives of ordinary Nicaraguans. In 2011 Pam and Paul published a beautiful 220-page book of photographs and testimonies, NICARAGUA: Surviving the Legacy of U.S. Policy. Order it here! 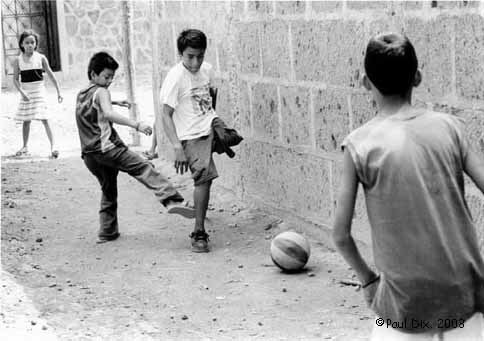 To learn more about the Nicaragua Photo/Testimony Project, see About the Book and About the Authors. All photos taken and copyrighted by Paul Dix, unless otherwise noted. Story of the Perez family, attacked by contras on December 31st, 1984. Lagartillo, Nicaragua. One photo of family survivors (1988). 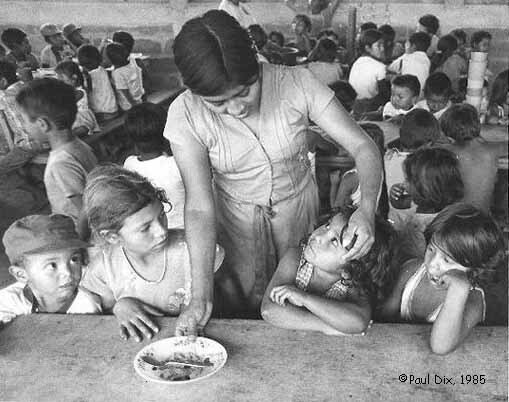 Nicaraguan children. Two photos (1985). Story of the Lumbi Rizo family, attacked by contras on December 8th, 1986. La Unión, Nicaragua. Three photos (1987 and 2003). Burials of young Sandinistas killed by contras in Rio Blanco (Matagalpa) and Jinotega, Nicaragua. Two photos (1985 and 1986). Story of the Zúniga Martinez family, including Alexi, injured by contra gunfire as an infant in 1987. Three photos (1988 and 2003). Story of Carmen Mendieta, killed by contras near Rio Blanco, 1987. One photo (1987). 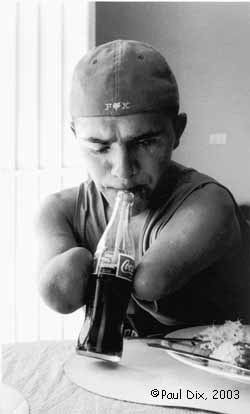 Story of Catalino Granado Aródiga, injured by an anti-personnel mine at age 8 in 1990. One photo (2003). 1984. Story of the Perez family, attacked by contras in Lagartillo, Nicaragua. 1988 (May). Surviving members of Perez family in their home at the Lagartillo Co-op and Resettlement Camp. The family's father, Jose Angel, and 20-year-old daughter, Zunilda (who was crippled by polio), were killed defending their home and community from a contra attack on December 31, 1984. Click here to read more of the Perez family story (adapted from recorded testimony taken November 2002). 1985. Department of Nueva Segovia. Children's dining hall at the Jumuyca Co-op and Resettlement Camp. 1985. 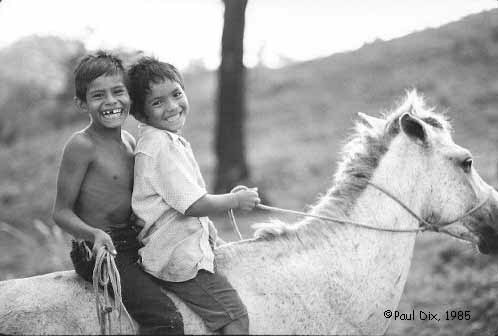 Two little boys on horseback, near Rio Blanco. 1986. Story of the Lumbi Rizo family, attacked by contras in La Unión, Nicaragua. 1987 (February). 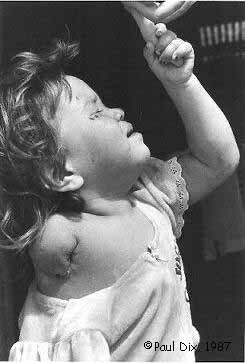 Two-year-old Luz Mabel Lumbi Rizo lost her arm to a contra bullet when her home in La Unión was attacked on the 8th of December 1986. Her father, Jose Francisco Lumbi Herrera, 52, was killed, as was Luz Mabel's 38-day-old baby sister, Zaida Lorena. Her mother and four other children were wounded. 2003. 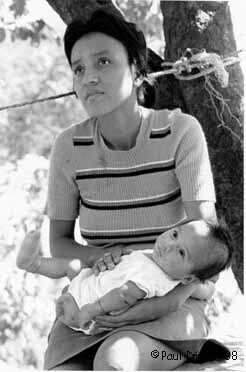 Sixteen years later, 18-year-old Luz Mabel Lumbi Rizo pictured at right with her daughter Luz in La Unión. 1987. 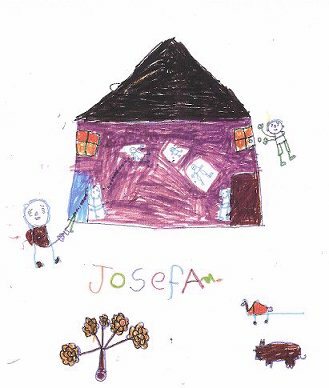 Luz Mabel's sister who survived the attack, 12-year-old Josefa LumbiRizo, drew the picture to the left. Josefa's drawing shows a contra firing into the house, while another throws a hand grenade through a window. Her two brothers are holding the doors shut. 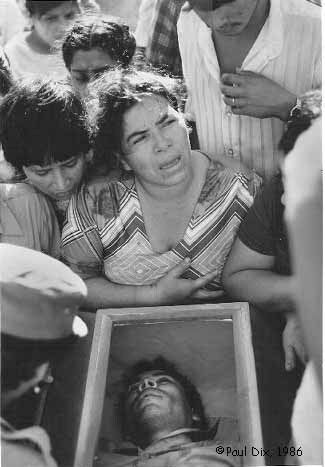 Her father and sister lie dead next to Luz Mabel who is wounded. All members of the family were unarmed civilians. Click here to read more of the Lumbi Rizo family story (adapted from recorded testimony taken February of 2003). (At right) 1986. Jinotega. Sofia del Carmen Palacios, weeping over the body of Enrique Moran Velasquez, the husband of her sister, Ismelda. Enrique was one of 6 security police (non-combative) killed in a contra ambush on March 27th (Holy Thursday). (At left) 1985. 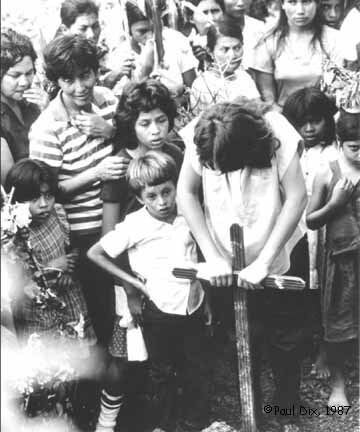 Burial of Sandinista soldier killed by the contras. Rio Blanco in the department of Matagalpa. 1987. Story of Carmen Mendieta, killed by contras near Rio Blanco. 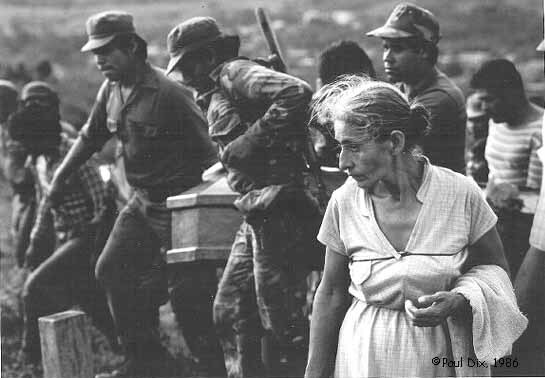 Carmen Mendieta was a beautiful, tiny, yet powerful organizer in Bocana de Paiwas. Paiwas is a small, one-phone town of about 1,000 in the middle of Nicaragua, nestled in the crook of two joining rivers. Carmen had worked for over a year with the development project Cristo Rey (established by "Padre Jaime" - U.S. priest Jim Feltz - with mostly German donations), and was a Delegate of the Word in the Catholic church. She was former head of AMNLAE, a Nicaraguan women’s organization, in Paiwas, and had started a sewing cooperative. Because she was a leader in the community, Carmen knew she was a contra target. She did not casually leave Paiwas. On Wednesday, December 2, 1987, Carmen did, however, ride in an armed truck to Rio Blanco to buy electrical wire for a child care center that was being built in Paiwas. Yamileth, her 15-year-old daughter, was attending school in Managua and this same morning was preparing to board a truck with her theater group. As Carmen and two other women who had hitched a ride along the way were traveling to Rio Blanco the contra attacked and killed all three. Carmen was 34 years old, and left behind 7 young children. Because Paiwas had a radio system, they were able to get word to Managua within half an hour. A priest reached Yamileth and took her off the theater truck. That truck was attacked later in the day and 4 students were killed. Yamileth feels that, at some spiritual level, her mother died to save her from being killed in the theater truck. Yamileth, now 30, is the oldest of Carmen's children. She still lives in Paiwas and continues the work of her mother. She is a phenomenal organizer, and the moving force behind the radio station in Paiwas (Palabra de Mujer) and a women’s health center (Casa de la Mujer). Her youngest sisters, Rosa and Norma, are also both active with the radio station and the women’s center. "We are aware of who killed [my mother]..., but we don't feel hatred toward them...the only ones we hate are the gringos because the gringos were the ones that made Nicaragua divide itself, that supported the contras, that gave them arms. ...the contra were also victims of the gringos and ... we, the Sandinistas... - we just had to defend ourselves because we had no other alternative. For that reason I don't hate the contra, but nor do I like them...Truly the only ones guilty of the war here were the North Americans...they have been the ones that have...marked our faces with lines of pain, of sadness, of nostalgia, of anguish from so many things." Carmen Mendieta, responsable en Paiwas de AMNLAE (Asociación de Mujeres Nicaragüenses Luisa Amanda Espinoza) cree que "está en juego el futuro de nuestros hijos. Por eso, las mujeres también tenemos que combatir. Como sea. Conseguiremos otro motor para el transporte en el río, vamos a producir más ropa en la cooperativa, vamos a hacer una cooperativa nueva para producir pan. Haremos de todo, no nos doblarán, no". Carmen Mendieta, head of the Paiwas chapter of AMNLAE, believes that "the future of our children is at stake. For that reason, we women must also fight. Whatever. We will acquire another motor for transport on the river, we are going to make more clothing in the cooperative, we are going to start a new bakery cooperative. We will do everything, they will not turn us back, no." On the 3rd of November, 1987, at 3:30 a.m., 57 U.S.-funded contra opened fire on the Reynaldo Vargas Campos farming cooperative at El Juste in the Department of Chontales in central Nicaragua (near Lake Nicaragua). That day, the farm was protected by Silvio Zúniga and 5 or 6 other men. Geraldine Martinez Galeano, Silvio's wife, grabbed their 2-month-old baby, Alexi Antonio, and ran into the hills. However, she returned to the farm before the contra had left. They fired on her, and the bullet passed through her back, exited through her stomach, and shattered the leg of baby Alexi in her arms. Three of Geraldine's family members were also killed in the attack. Her mother, Rita, was found dead in her home, shot in the chest and her body burned. Her 17-year-old brother, Zacarias, was killed by a contra grenade as the attack started, and his body also burned. Her brother Lorenzo was shot at least eighteen times. Alexi and his father now live in the nearby community of Juigalpa. His traumatized mother left the family within two years after the attack. Click here to read in Silvio's words about the attack on his family. According to Alexi (at age 15 in 2003): "My fourth and fifth prostheses I got from León. I'm in sixth grade and would like to continue with secondary school, but here it's hard to go to school - the uniform, shoes, backpacks, notebooks... I like sports...my favorite is kickball." 1988. Geraldine Martinez Galeano and son Alexi (3 months). Alexi lost his leg to a contra bullet one month earlier. 2003. Alexi (age 15) playing kickball in Juigalpa, Nicaragua. Two photos. 1990. Story of Catalino Granado Aródiga, injured by contra war-era land mine. One day in 1990, after the U.S.-funded contra war ended and the peace accords had been signed, 8-year-old Catalino Granado Aródiga was home alone in Rio Blanco. His family was poor and everyone was out working but him. He found a box, and out of curiosity, poked at it and tried to open it. It turned out to be an anti-personnel mine -- one of an estimated 150,000 mines that were placed in Nicaraguan soil during the contra war. In an instant, Catalino lost his left eye and both arms. Catalino spent the next 4 to 5 years in rehabilitation in Matagalpa and Managua. By the time he got back to Rio Blanco his mother was gravely ill. The photo at right, taken January 2003, is of Catalino at age 20. Both his mother and father are now dead, and he receives not one penny of support from the Nicaraguan government. The Organization for American States (OAS) helped with prostheses several years ago, but the devices caused too much pain to be of use. Catalino doesn’t feel close to his sisters, and they too are struggling for basic existence. However, he lives with one sister for a few days and then the other. A friend in Rio Blanco said people in the community help him with clothes and food when they can. But tall, strong, and handsome despite all his scars, Catalino says he’s never been depressed. When he has a bike -- which he didn't at the time the photo was taken -- he rides long distances, even to Boaco (about 60 miles). He even does flips off a cliff into a local swimming hole. 2003. Catalino at age 20. Questions or comments about this page? Send email to briley [at] efn.org. Last update: June 10, 2011.